When I moved to Madison County in 1973, this barn and its attached sign were prominent on the Marshall Bypass. Heading west on Hwy. 25-70, it was impossible to not see the barn or get the message. I’m almost certain this is the first photograph I made in Madison County. I’ve never been able to find the negative and the only evidence of the image was an old, badly printed 6x8 print; and my memory of making the picture. The print was relatively easy to fix with the help of digital imaging and a great assistant. But the actual picture making - stopping on the road, getting out my camera and pressing the shutter - proved to be harder than I would have imagined. I was concerned about making a photograph of someone’s private property, knowing the high value local people placed on their land and their land rights. I didn’t want to get shot, or yelled at, and it didn’t occur to me to find the owner and ask permission. I just knew I wanted, to the point of need, to have that image. So, one sleety day, after driving by the barn three or four times to make sure no one was there, I stopped and stole a shot, not without a certain amount of guilt. It’s a ubiquitous message in the rural South, and maybe it’s because I live where I live that it seems more evident in mountain communities. In 1973, coming from the North and Midwest, it was not something I had ever seen before and this barn became a clear symbol of my move to a place I knew nothing about. There was something about the starkness and the fundamentalism of the sign, and the prominence of its display, that made me feel that by making a picture of it I would be signing onto the program, or at the very least, accepting the fact that demonstrative belief played a big role in the community. 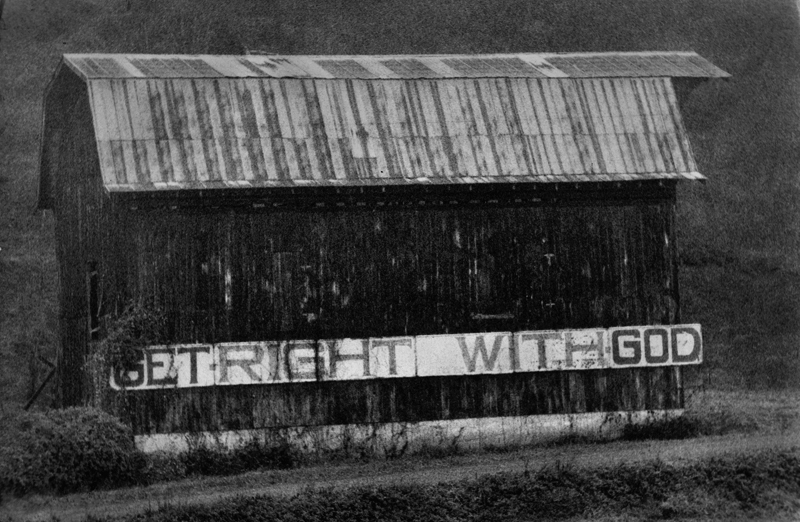 The sign is long gone, as is the barn, although the message remains. I see it everywhere – tacked to trees, printed on plywood, black on white.It’s a good message – Get Right With God – and I now can comfortably translate it to mean simply being at peace with myself, and my personal notion of a higher power. Years ago, however, the message for me was fearful, demanding and narrow, with an unmistakable “or else” quality about it. It gave me pause – not only for my very soul, but for how that unbending dogma would cast a shadow over my life should I stay.